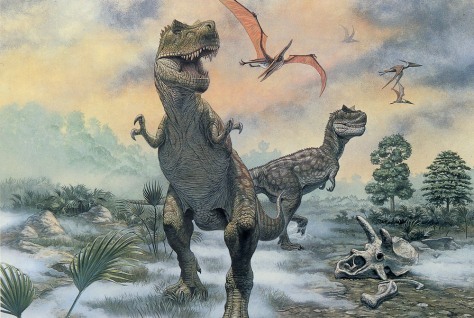 Copyright 1985 Mark Hallett, "Awakening of Hunger"
Two Tyrannosaurus rex adults are alert and ready to hunt. A pterodactyloid pterosaur Pteranodon ingens overhead. The scene takes place on the margin of a floodplain in the future area of western Montana, during the Hell Creek formational time of the late Cretaceous Period.